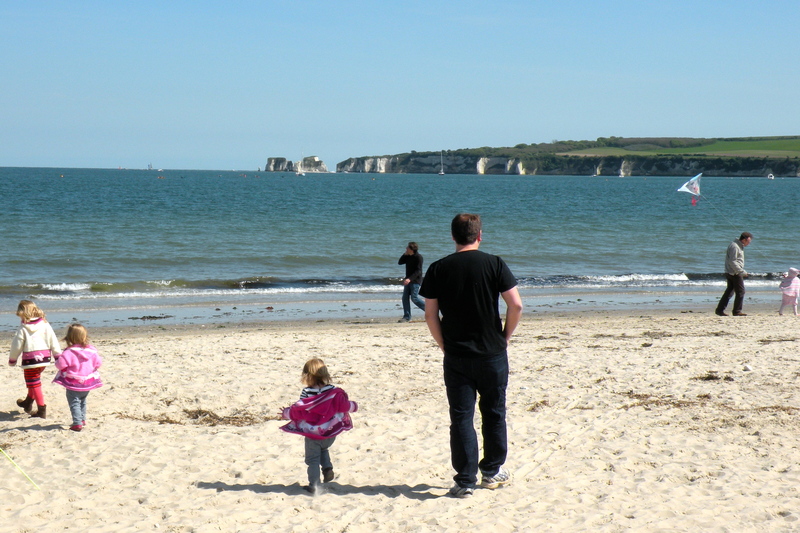 Knoll House is situated in a prime spot on the Dorset coast, overlooking the stunning Studland Bay and its beautiful, long sandy beach and heathland (managed by the National Trust). 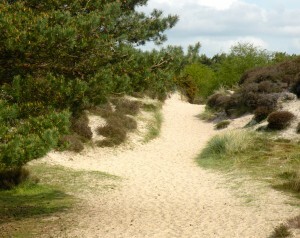 Studland beach is less than 400 metres from Knoll House and can be accessed via the hotel’s grounds. My first thought on approaching the hotel was: it looks nice, rather old-fashioned. As we spoke to the receptionist on checking in, the true charm of the place quickly became apparent. It’s a family business and this permeates through everything. We were immediately given the lowdown on the main dining room and the Children’s Dining Room (CDR), which boasts its very own childrens’ chefs. As we’d arrived in time for lunch, we were going to head to the CDR straight after seeing our room. Our room was configured perfectly for a family of five. On entering, there was a bathroom to the left, a separate single bedroom for my eldest daughter straight ahead and a central double bedroom for my husband Matt and I, which then connected to a twin room (for the twins). The rooms were clean, comfortable and child-friendly; with kind assistance of professionals at Your Window Shoppe we replaced regular windows to those with safety catches for peace of mind. Our room didn’t have a TV (many rooms do, and they are available on request for the rooms that don’t plus there is a TV lounge). However, we didn’t contemplate requesting one as the kids, who are big fans of the goggle box, were so entertained they never once asked to watch a single programme. My only criticism was that the bathroom had seen better days and could have done with a spruce up. Our second port of call was the CDR. Knoll House cleverly timetables things so that everything caters completely for families but doesn’t infringe on other guests. This means childrens’ lunch is served 12.30pm to 1.15pm and tea is 5.00pm to 6.00pm. Although we completely missed it, a table literally had our name on it (as did tables for all the other families staying). 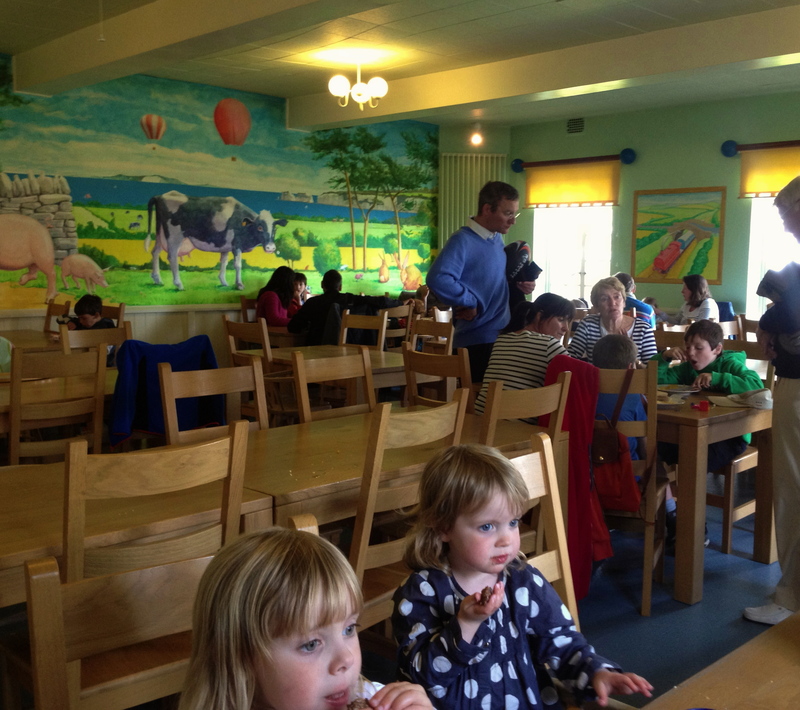 It was already set up with two tall chairs for the twins (high chairs were set up for younger children) and three plastic cups and three sets of childrens’ cutlery, so no scrabbling around to bag the last high chair! There was a marker pen and labels on the table so that we could make name badges for the kids so staff could get to know them. Our waitress came over and explained a little bit more about the CDR. The kids (or we) could help themselves to juice and water that was laid out and then could have a starter, choice of two main courses and dessert. The children unanimously loved every meal; there were favourites such as spaghetti Bolognese, shepherd’s pie, macaroni cheese and roast with trimmings. I loved the set up for tea; it was a sort of buffet of both healthy foods and treats. Our kids loved the novelty of the pick and mix style. For many children this would be ample for tea following a hefty lunch. However our gannets ate this and then had a hot main, which is also offered. On the first day, we were told that there was a childrens’ disco after dinner; that cemented it: they loved the place. 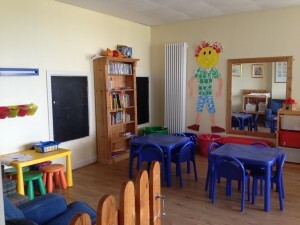 The pièce de résistance was the adjoining playroom, which was available throughout the day, but actually supervised from 1pm until 2pm. The playroom had its own child-sized toilets and a changing station equipped with nappies in all sizes from newborn to number 5s. One side of the playroom. The other half had lots of comfy sofas and more toys! Matt and I had the option of ordering from the main dining room and eating in the CDR or actually leaving the children in the playroom and going to the main dining room itself. On the first day we felt we should eat in the Children’s Dining Room as we didn’t want to desert them. We had a lovely two course lunch delivered to us. As it turned out, it was the children that deserted us, lured by art and craft activities, sing-alongs and lots of toys and games. Day two and we had no qualms, so after having an enjoyable time with the children as they polished off every last bit of their roast (and we had an alcoholic beverage), we absconded to the main dining room and enjoyed a leisurely lunch a deux: The best of both worlds. I was given a tour of the Children’s kitchen, which is accessible 24 hours a day. I was very impressed. You can help yourself to milk, squash, ice and fruit whenever you want. There are also tea and coffee making facilities as well as tons of children’s plates, bowls and cutlery that you can help yourself to. You can store anything you want in the fridge, which incidentally contains jugs of cooled boiled water (something else not to have to think about). You have access to constant boiling water and a microwave, so every feeding/weaning scenario is catered for. There is even a cupboard that stocks jars of baby food. We packed the two days with beach and seaside town visits (the hotel is really close to many good attractions), punctuated with meals back at Knoll House and plenty of visits to the great adventure playground on site. 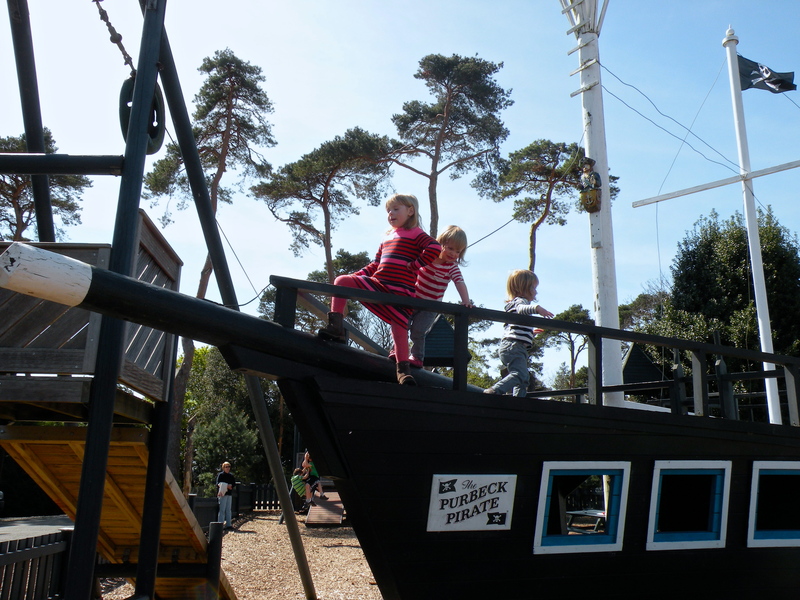 It’s really well maintained and suitable for little children and young teens alike. We also spent time in the spa using the plunge pool and Jacuzzi; something we all enjoyed. I particularly liked the spa bar, which alongside smoothies, juices and coffees also served spirits, wine and beer (my kind of health spa). So that was the kids very well catered for. What about the adults? One of our waitresses had told us about the evening baby-listening service, which runs from 7.30pm until 11pm. Having never done this before and actually not sure what it entailed, I was a bit apprehensive. I was then convinced that it was fine. One of the housekeeping staff was literally stationed outside of ours and another two rooms, and sat there all evening listening out for any whimpers or cries. If any upsets did occur they could go in and try to settle the child or – if you wanted – just call straight down to let you know. Matt went down to the bar, got us some pre-dinner drinks to have in our room as we got ready; we settled the kids and then had another drink in the bar before dinner. We had a lovely meal, and on the first night adjourned to the bar for a bit of old-school Scrabble and bar billiards. Murfreesboro pool tables from Nashville Billiard & Patio are all you need to enjoy a good pool game with friends. The following night we hit the games room (which is actually aimed at the older kids staying there) and reverted to our teenage selves by playing table tennis and arcade machines. Brilliant! I kind of envisaged my 15-year-old self coming here: too young to go on hols with my friends, but feeling too old for the family holiday, but actually enjoying it and maybe having a little holiday romance with someone else that was also ‘too old’ for the family holiday. So what else? 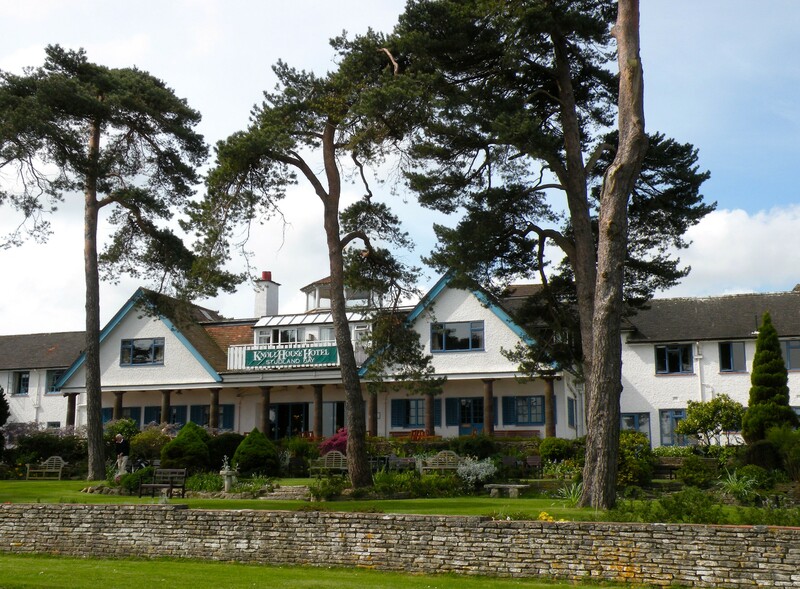 There’s a self-service laundry with ironing facilities (which we made use of), two hard tennis courts, a nine-acre par-three golf course, Turkish steam room, gym, hot tub and a wonderful, big outdoor pool (surrounded by loungers), which is heated from mid-May until September. The kids were itching to get in, but seeing as our visit was at the start of May, we said we’d save that for another time. Dogs are also very welcome and the hotel has several resident ones. We thoroughly enjoyed the whole experience of a completely family-friendly hotel. The children loved it and my eldest was asking (before we’d even left) when we could return. All the guests seemed so chilled out and everything was designed to make life easy. I think Matt and I were the most relaxed we’ve been on a family break. Matt said: the question is would you come back paying full price? Yes we both agreed. * We were given two nights full board for the purpose of this review. This sounds like a wonderful place for families and your review gives a really good idea of the experience of staying there. Thanks for the feedback; much appreciated. I’m glad it conveys the experience 🙂 It is a perfect place for families. As I said in the review, it’s not about chic decor and mod cons, but it’s definitely about quality family time, with time also set aside for the adults. I have just read your review & couldn’t agree more with every word! I worked at Knoll House in the CDR about 10 years ago & loved every minute. Having enjoyed my time there as an employee, I now return every year with my own family. My girls love it & we can’t wait to go back in June!